Accessing Root on Mac OS X 10.8.2 or rather OS X 10.8 is quite easy with 3 commands. 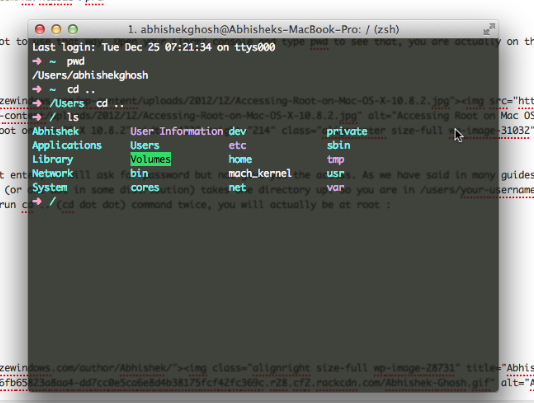 We will use iTerm2 to show you Apple Mac’s root, you can use Terminal too. As we all know by now, Apple Mac OS X is now OS X and lacks various things which we have fixed to ‘normal’ through previous guides. Practical application of Command Line was demonstrated on Installing WordPress on Mac OS X With Command Line LAMP Configuration Read more: Install WordPress on Mac OS X With Command Line LAMP Configuration guide. We do not love those MAMP, VAMP (if exists) etc. extra loads. We have run ls to list the directories on the root. Keep in mind, if you wrongly delete something serious, you will be in real trouble. Do not play without the basic normal sense that deleting a system file makes an OS mad. Tagged With root command in mac os , UNİX WİNDOWS MacOsx Symbian OS? This Article Has Been Shared 9503 Times! Cite this article as: Abhishek Ghosh, "Accessing Root on Mac OS X 10.8.2 : Its UNIX Darling," in The Customize Windows, December 25, 2012, April 26, 2019, https://thecustomizewindows.com/2012/12/accessing-root-on-mac-os-x-10-8-2-its-unix-darling/.